In Northern Genabackis, just before the events recounted in 'Gardens of the Moon', a raiding party of savage tribal warriors descends from the mountains into the southern flat lands. Their intention is to wreak havoc among the despised lowlanders, but for the one named Karsa Orlong it marks the beginning of what will prove an extraordinary destiny. Some years later, it is the aftermath of the Chain of Dogs. Coltaine, revered commander of the Malazan 7th Army is dead. And now Tavore, elder sister of Ganoes Paran and Adjunct to the Empress, has arrived in the last remaining Malazan stronghold of the Seven Cities to take charge. Untested and new to command, she must hone a small army of twelve thousand soldiers, mostly raw recruits, into a viable fighting force and lead them into battle against the massed hordes of Sha'ik's Whirlwind. Her only hope lies in resurrecting the shattered faith of the few remaining survivors from Coltaine's legendary march, veterans one and all. In distant Raraku, in the heart of the Holy Desert, the seer Sha'ik waits with her rebel army. But waiting is never easy. Her disparate collection of warlords - tribal chiefs, High Mages, a renegade Malazan Fist and his sorceror - is locked in a vicious power struggle that threatens to tear the rebellion apart from within. And Sha'ik herself suffers, haunted by the private knowledge of her nemesis, Tavore...her own sister. House of Chains, the fourth instalment of Steven Erikson’s incredible Malazan Book of the Fallen, returns to the dangerous and rebellious desert continent of Seven Cities. This was also the setting for Deadhouse Gates, the second book in the series, and there is a poetic sense of symmetry in the journey of the new untested Malazan army as they retrace the path of those tragic events. That they are quite literally walking in the footsteps of the legendary Coltaine is a perfect metaphor for their struggle to defy all expectations and complete the seemingly impossible task they have been assigned: to defeat the Whirlwind rebellion once and for all. Despite this symmetry and the return to Raraku, House of Chains in no way feels repetitive, or even remotely similar to Deadhouse Gates. The tone is completely different, and although the plot is largely focused on the events of the Whirlwind there is a huge amount of reference to wider events that makes House of Chains feel much more like an instalment of a sweeping epic rather than the almost standalone story of Deadhouse Gates. 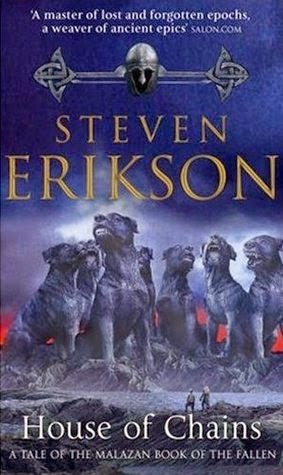 Erikson delves further and deeper into the Malazan mythology, introducing us to primal beings from the dawn of time – such as the Eres’al and the Deragoth – and flinging them headlong into the main events. The depth of worldbuilding evident here, particularly the skilful interweaving of complex histories and events is astounding, and Erikson manages to interlace multiple storylines together seamlessly. As with other books in the Malazan series, there is revelation after revelation, increasingly creating the impression that everything within this universe is connected in some way. Although the events of House of Chains are not on quite as grand a scale as previous books, it nonetheless conveys an atmosphere of epic grandeur: through the setting, through embedded references to history and ancient mythology, and through the unique and captivating tone and atmosphere present in all the main books of this entire series. However, in spite of his staggeringly ambitious storytelling, Erikson never loses sight of the one thing that really brings this series to life: the enormous cast of diverse and unforgettable characters. In addition to revisiting a few old favourites – cynical Sergeant Strings, deadly assassin Kalam Mekhar, and of course the diabolical and insane High Priest of Shadow Iskaral Pust – House of Chains also introduces several staple characters of future books in the series, such as Tavore’s Fourteenth Army, the exiled yet noble warrior Trull Sengar, and the undead outcast Onrack the Broken, not to mention one of the best characters of the entire series: the mighty Karsa Orlong. The characters are, as always, fantastically well-written and incredibly varied: there are flawed heroes, greedy mages, grizzled veterans, brave barbarians and tired commanders, as well as plenty of despicable villains and unhuman antagonists. I personally really enjoyed the developing relationship between Lostara Yil and Pearl: Erikson is adept at creating unconventional chemistry and realistic relationships within a relatively small amount of page time, and I felt personally invested in everything that was happening to these two characters in particular. The plot of House of Chains follows a slightly unconventional format in that the first quarter or so of the book focuses entirely on one character, before reverting to the characteristic shifting POV narratives used throughout the previous books. The tale at the beginning – of Karsa Orlong’s rise and fall prior to the main events of the series – is so good that I feel it could easily have been extended to fill the entire 1,040-page novel by itself. Instead, we have a spectacularly condensed account of Karsa’s origins and development that spans the course of several months and numerous continents, and finishes in a way that leads perfectly into the main events of the story. These events are rarely less than thrilling, and although there are a few less-than-exciting sections – particularly those centred around Gamet, as well as a few repetitive exposition scenes regarding the nature of light, dark and shadow magic – this occasional slowing of pace allows us to take a welcome step back from the otherwise climactic series of events. Erikson’s awesome talent for creating exciting convergences continues to manifest in House of Chains, and the way he manipulates the rapidly shifting POVs to increase the pace, build tension and maximise momentum is, as always, nothing short of masterful. Once again, I’m in awe of Erikson’s storytelling. The combination of clever pacing and intense narrative, along with its complex web of events and unique characters truly earns House of Chains the title of ‘epic’, and continues to reinforce The Malazan Book of the Fallen as the best and most ambitious epic fantasy series I’ve ever encountered.